The contrast of the blue and white tiles with the dark red painted brick is strikingly attractive! Expressions of Spanish culture can be found around Greenwich Village. One such example is the striking blue and white tiled blind arch on the side of the apartment house at 88 Perry Street. This building, on the southeast corner of Bleecker Street, was built between 1866 and 1868. The plumbing firm, Brien & Adams, built it to designs of the architect Robert Griffin Hatfield (1815–1878); the company built it as an investment property. Five stories in height, this apartment house was built of brick in the style of the time. This color combination dates from Spain’s claim to the Netherlands as its territory. Manuel Jimenez bought 88 Perry Street on February 3rd 1970, nine months after NYC’s Landmarks Preservation Commission designated Greenwich Village a Historic District on April 29th 1969. He opened a Spanish antique shop in the ground floor store front; he called it El Rastro, for the market in Madrid. 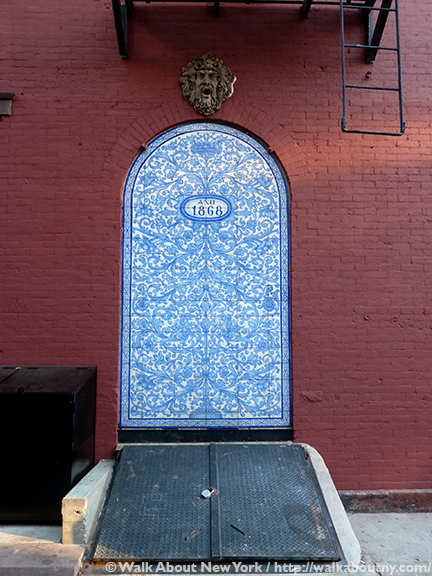 Señor Jimenez renovated the building, which included adding the blue and white tile mural within the blind archway on the building’s Perry Street façade. Checking text messages beside a beautiful work of art. 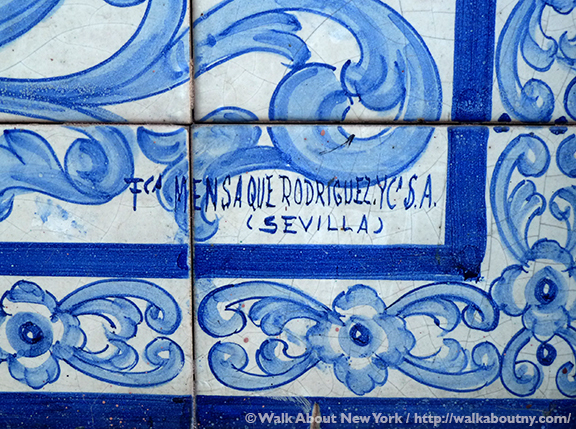 These tiles are known as azulejo. 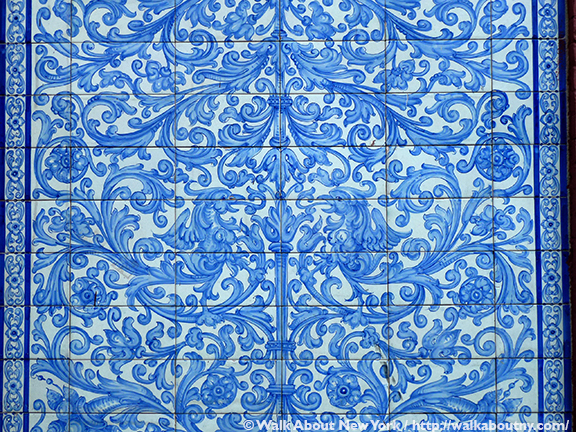 “Azulejo” comes from the Arabic “al zulaycha,” meaning little polished stone; the term is used in Spain and Portugal to refer to terracotta tiles that have an opaque glaze. 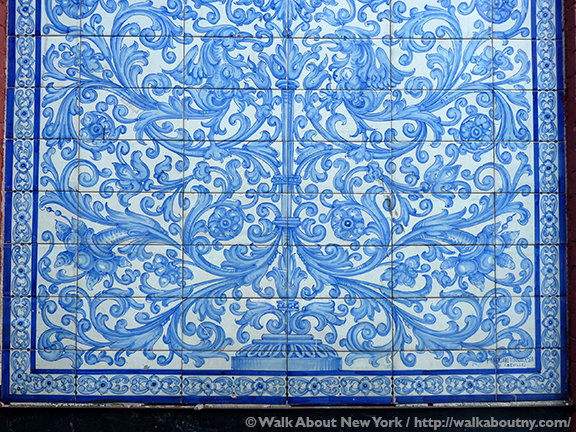 Walls, fountains, walkways, ceilings, baths, fireplaces and other surfaces in Spain and Portugal have been covered and decorated with azulejo extensively since the 13th century. Tile mosaics had their origins in the Middle East and North Africa; the Romans spread their use through Europe. And the Moors reinforced their use during their 700-year-long dominance of the Iberian Peninsula. A mosaic is created not by assembling small pieces of polished marble, known as tesserae, but with fragments of glazed colored tiles. Tile murals, such as the one at 88 Perry Street, are created by assembling whole tiles, each with a part of the picture on it, like a puzzle. The signature of the tiles’ manufacturer is in the lower right hand corner. The tiles in the Perry Street arch were manufactured by Fábrica Mensaque Rodríguez y Cía, founded in 1917 by Enrique Mensaque Béjar, Manuel Rodríguez Alonso and Tadeo Soler Navarro. The company produced materials for religious and private clients; Antonio Hermosa, a ceramic artist, specialized in azulejos. The company went out of business in December of 2006. There were one gas lamps flanking the tile mural. The mural is executed in time-honored colors and motifs used to decorate ceramics throughout Spain, and in particular in Andalucia, in the southern part of the country. The Middle Eastern and North African influences were the strongest there. The tiles contrast brilliantly with the building’s painted red brick wall. The date “Año 1868,” is the year that Spain’s First Republic was proclaimed, and coincidentally that same year the 88 Perry Street was completed. “Año 1868” is the year the first Spanish Republic was declared. 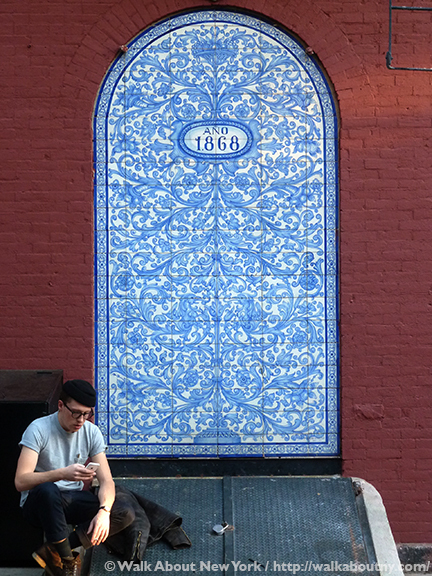 Beautiful detail of the tile mural at 88 Perry Street. Although the mural is a beloved work of art and a local landmark, since 2009 the Landmarks Preservation Commission (LPC) of New York and the residents around 88 Perry Street have had an on-going dispute about removing the mural. The tenement building stands in a registered historic district. When the mosaic was commissioned and installed in 1972, approval was never asked for from the Commission. The Landmarks Commission wants the mural removed and the wall restored what it looked like in 1972. It is not easy to understand why the LPC is suddenly fussing about the artwork, and insisting that it be removed. It is a beautiful addition to the neighborhood, and deserves to be grandfathered into the area. The mural has become a meeting point for folks in the West Village. 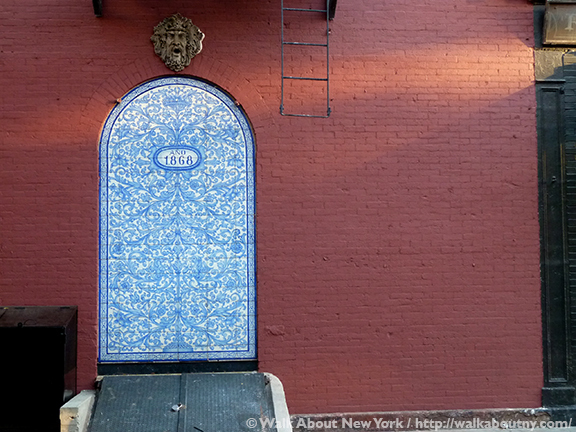 It is a happy reminder of Little Spain and the Spanish immigrants who were once a vibrant part of Greenwich Village. We say, let it stay! There is a real mystery above the mural, the face of Bacchus, with the traditional grapes and grape leaves decorating his hair. 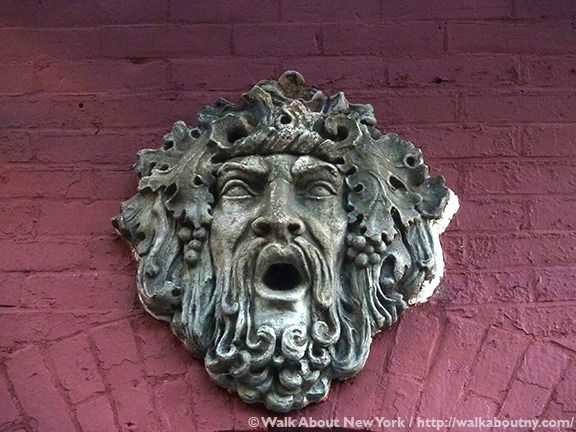 It appears to have once been part of a fountain, the water flowing from the Roman god of wine and merrymaking’s mouth. If the tile mural goes, it would seem that Bacchus must be removed too. These whimsical touches give The Village its character. Leave them be! 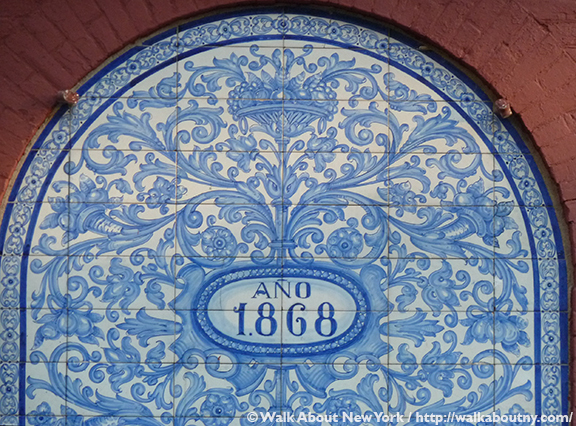 The blue-and-white tiled arch is a featured attraction on our Greenwich Village Walking Tour. Get a feel for Old Spain and for Little Spain when you see this delightful sight. Take the Tour; Know More!